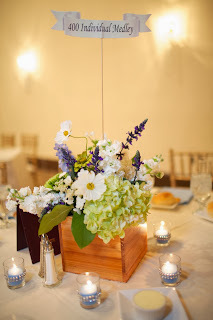 This is a perfect way to incorporate your theme. I went to my cousins wedding where all the tables were named after cities in Texas, where they were going to be moving to. I thought 'what a creative idea!?' So much better than 1, 2, 3, 4, and so on. Since Matt and I met swimming we decided this would be our theme. 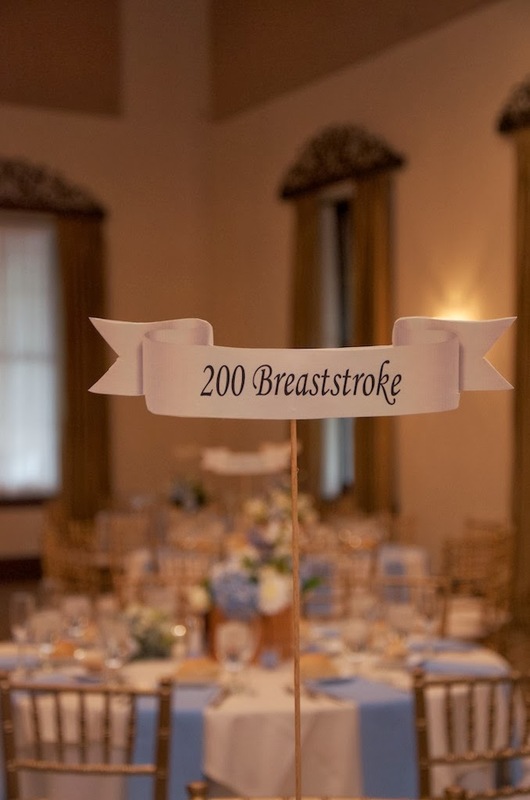 Early on in our planning phase we thought it would be fun to name our table numbers after swimming events. Not only would this be different, but it would possibly start a conversation at the table. 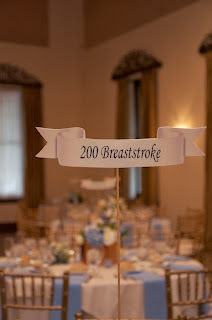 The table numbers fit perfectly with our swimmer ribbon place cards. Once we had the table names figured out, we had to find a nice way to display them. I had heard of people 'jazzin up' dollar store frames, but when I went to look at them, they looked soo cheap. After looking online and racking our brains during an afternoon of wedding planning my mom found a banner coming out of the centerpiece. Can you say perfect!? Banners/flags are all over the place in swimming. Are you a couple that travels? Name your tables after cities you have been to. Do you love a sports team? Name your tables about players with their number or football stadiums. Love golf? Name the tables about holes and have holes on flags. Did you meet at college? Name your tables after the halls. A fun spin on number 1, 2, 3, etc. is framed pictures of the bride and groom at that age. Talk about a conversation starter! Love to read? 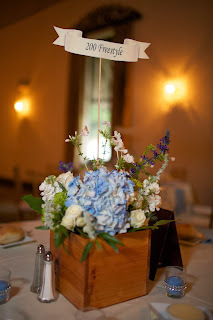 Name your tables after books and incorporate this into your centerpiece. It is so easy to get your hands on cheap books! *DIY project* love it! Run marathons or do triathlons? Name your tables after all the races you have done. Rock N' Roll Marathon, Pittsburgh Marathon, etc. Then make little number bibs for place cards! Love gardening or flowers? There are hundreds of flowers you can use to name your tables after. Each centerpiece could be a bouquet of that flower. Love dogs? Name your table after breeds. Are you getting married at an art museum? Name the tables after famous pieces of art. You will need a computer with photo shop, a printer with ink (make sure you have enough, you don't want it to look faded), cardstock, scissors, thin sticks of wood, wood stain, brush, and double sided tape. The cardstock, thin sticks of wood, and double sided tape were from Michaels. Step 2: Edit the banner in Photo Shop. Play around with the banner to make it look 3D. Step 3: Print several pages to make sure you like it. Step 5: Carefully cut the banners. Step 6: Stain the thin sticks of wood. Wait for them to dry. Step 7: Once the sticks are dry, put the banners at the top using double sided tape.